Renovating your kitchen is an excellent way to improve its look, increase the value of your home and appeal to a more diverse range of home buyers if you decide to sell. However, a kitchen remodel can easily cost $10,000 to $20,000 or more, which is why you want to make choices that you can live with. Learning more about some of hottest trends for 2015 can help you decide what you want and don’t want in your kitchen. Trends come and go, but the classics remain constant. One of the hottest renovation trends for 2015 is a more traditional look. Homeowners today are no longer attached to trendy colors and modern designs; they want homes that have a more traditional look and will retain that traditional look for years to come. 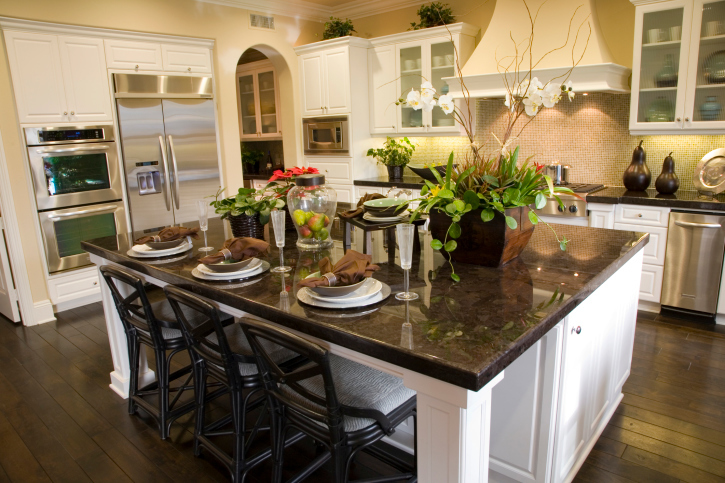 Experts predict that 2015 will bring a return to darker wood colors for cabinets, tables, counters and even floors. There are also some reports that homeowners will use oil rubbed bronze and darker pulls and handles on cabinets and drawers as opposed to flashy and contemporary chrome accents. Other trends include rustic farmhouse tables, double porcelain sinks and natural stone counters. It’s hard to go anywhere today without seeing or hearing about green decorating trends, and those trends carry over into kitchens. Homeowners want products made from recycled materials and the chance to “go green” at home. Adding a recycling center is just one of the hottest trends for the kitchen. Designers also found that homeowners want counters and floors made from recycled or sustainable materials. Bamboo is a sustainable construction material that works well in flooring applications. Homeowners can also find counters made from old tires, soda bottles and other recycled goods. Ask anyone want they need in their homes, and the odds are good that many will say they need more space. Recessed lighting is one trendy accent that adds more space and reduces the number of fixtures and cords hanging down from the ceiling. Other ways to add more space include adding an island with storage to the center of the room and cutting down on the number of cabinets lining the walls. There are a number of trendy ways that you can renovate and change your kitchen. Going green, adding more space and bringing in traditional elements are just a few of those ways. Talk with a real estate agent about other changes you can make that will add value to your kitchen.